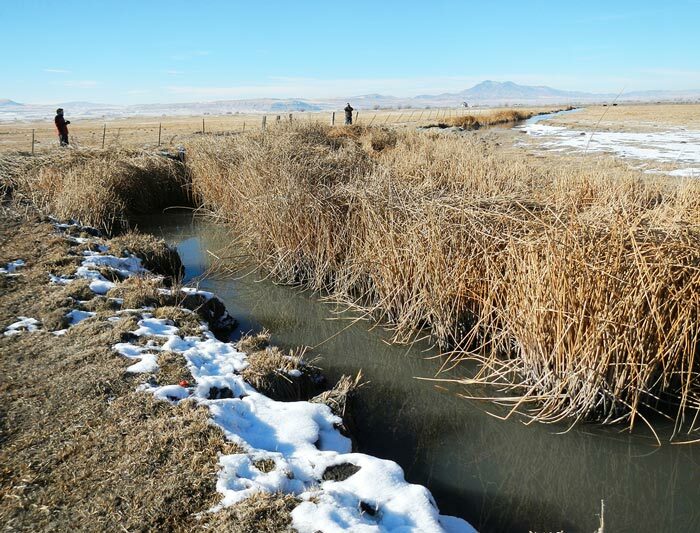 Description: This is private land that is open to public access through an arrangement with the Utah Division of Wildlife Resources. Although often referred to as "the" Cowley Walk-in Access, the Cowley WIA has three separate tracts in Cache Valley which are each separated by several miles. This one has a small creek flowing mostly through a pasture. In the spring it may flood, and then it provides habitat for migrating shorebirds. Its proximity to the Logan Sewage Lagoons makes it a great location for fly-over waterfowl. Directions: Head west on 1000 N from Logan. The parking area is where this road dead-ends at about 1900 W.
Good Birds: This can be a great place for shorebirds in spring if the flooding of the fields corresponds to shorebird migration. Savannah Sparrows can be abundant in the breeding season. The stream hosts lots of Song Sparrows and some Marsh Wrens and Virginia Rails. Bobolinks have been seen here. Rare Birds: This location was just opened to the public in 2011 and quickly made it on the local birders' radars when a Swamp Sparrow was found in the corrals just south of the parking area in late December 2011 and continuing into January 2012, only the second of that species to be seen in Cache County and the first in almost 20 years. Other: There is a DWR sign-in book at the parking area that you MUST fill in to have permission to access the property. If you are not carrying the tear-out receipt from this book with you, you may be cited for trespassing. You might also want to note in the comments section that you are birding, to help show the DWR that is not just hunters who use these public access areas.